Gamer Scares Himself Witless Playing Slender. Posted on August 3, 2012 by Big Red	in Funny Booty, Gaming Booty and tagged gameplay videos, hilarious slender video, pc games, scary pc games, sleder gameplay, slender, slender game, slender game attempt 4 video. There’s an independent PC game out right now that’s causing a bit of a stir it’s called Slender which is a psychological horror/survival game. It’s been scaring the bejesus out of thousands of gamers so far, including the guy featured in the video above. Only there’s an added bonus to his experience which is well worth the wait. The Only Game You Need To Own This Xmas. Posted on September 5, 2011 by Big Red	in Funny Booty, Gaming Booty, Geeky Booty and tagged gamers, games, games news, gaming, gaming news, pc games, simulator games, street cleaning simulator. With a ton of triple A gaming titles scheduled for release before Christmas including Call Of Duty: Modern Warfare 3, Saints Row The Third, Uncharted 3, Oblivion: Skyrim, Rage, Battlefield 3 and Batman: Arkham City to name but a few, there is only one title you should be gearing up for, a game so realistic and grimy it’s like you’re actually there, a game where your sole objective is to keep the city’s streets clean…quite literally. Just look at that realistic dirt inertia! Brush off the dirt and make a clean sweep as you embark on a career to become an accomplished street cleaner. Choose from a selection of highly detailed sweeping machines as you navigate the city in search of detritus. From industrial areas, to residential and retail districts to motorways and even fairgrounds your skills are much in demand to bring shine and sparkle to the city. As your experience grows, so will your tasks as you have to deal with ever more complex contamination using authentic clean-up techniques. With individually controllable brushes on your vehicle, along with manual management of the water tank, dirt traps and fuel, each vehicle is the ultimate in realistic simulation, complete with full 3D cab views. Get up close to the grime with custom zoomed camera views and a dynamic particle system as your cleaning vehicle devours the dust in 14 challenging missions. Polish up your business as you spend your hard earned income on upgrades and additional vehicles. 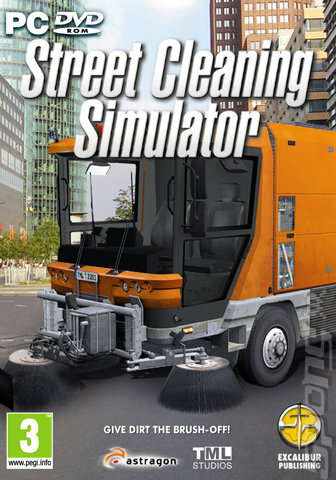 Consider yourself bought Street Cleaning Simulator. Discarded syringes and johnny bags be warned, you’re on borrowed time! Can’t wait for the special London Riot Clean-Up DLC.